A lovely day here today – I made sure I offset the boringness of an epic supermarket shop with a trip to the playground on our estate. Coco and Otis are looking forward to the schools going back – not because they’re old enough to go, but because they get their normal play areas and haunts back again from the big kids! And I’ll admit I’m secretly looking forward to it too. The return of school means the return of autumn – there are some gorrrrrgeous autumn items out there, and I’ve already started stocking up for both kids (I should *probably* check to see what they’ve already got first….). But for the moment, we are enjoying the latest days of summer, short sleeves, no extra layers. H&M are great for multi buys – this tshirt was bought as part of the 3 for 2, along with a go-with-everything navy one and an acid yellow/chartreuse one, that happened to match a gorgeous little gipsy skirt Coco had had sitting waiting in the cupboard for 2yrs, ready for her to fit into. I can’t help it, I do like an advance purchase….!!! 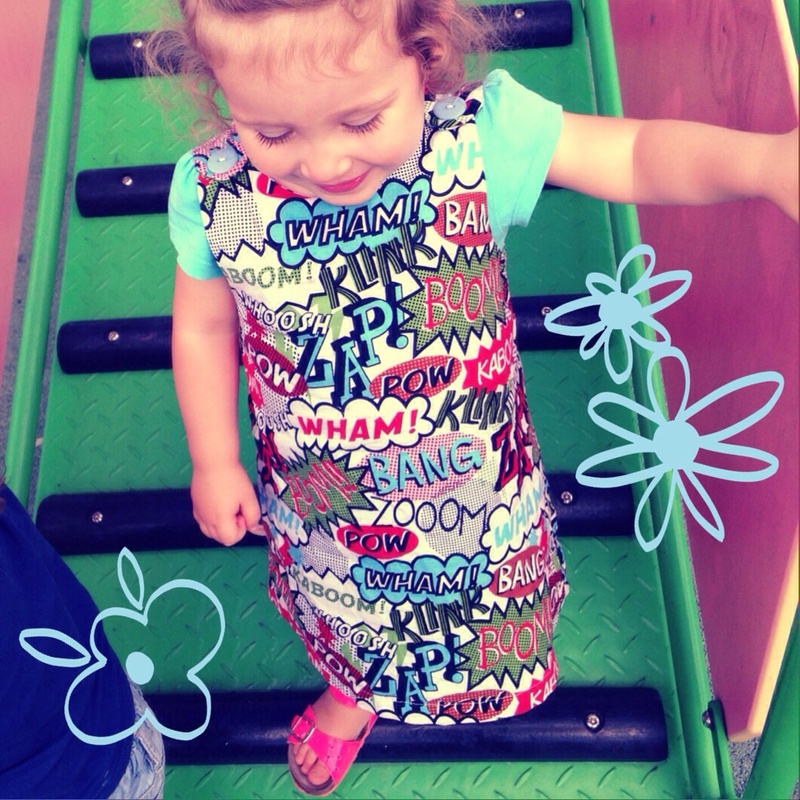 The dress is not exactly perfect for the playground (it’s handmade and not that practical for sliding down backwards on the mega slide! ), but I absolutely adore it, it’s just so Coco. Loud, bright, not to be ignored. I’m looking forward to layering it with a long sleeved red tshirt or red cardie for the winter – hopefully it will see her through to spring, when I think it will get a bit small for her. Anyway, I still owe you a post on my favourite autumn/winter shoes, and am currently doing a ‘1 item, 3 ways’ post too. Lots to be getting on with! Thanks to everyone for reading so far, and for liking and sharing my page – I can’t offer any giveaways to thank you, but please know I’m sending you all Coco hugs and slightly-inappropriately-open-mouthed Otis kisses!